Books and Tapes by Michael Rosenbaum, M.D. 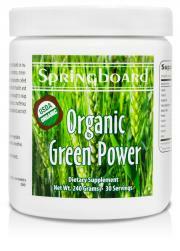 Springboard's Organic Green Power™ is a nutritionally dense blend of green superfoods that will help energize your body, alkalize your blood, detoxify your cells and strengthen your immune system. This blend of juiced grasses, algae, fruits and vegetables powders provides a source of highly absorbable vitamins, minerals, fiber, amino acids, carotenoids, and other critical phytonutrients to create better overall health and longevity. Organic Green Power™ also provides three probiotic strains of bacteria including Lactobacillus gasseri, Bifidobacterium bifidum and Bifidobacterium longum. These beneficial strains of bacteria colonize the intestinal tract and help with the assimilation of nutrients, elimination of waste, synthesis of vitamin K and most B vitamins including biotin and folate; as well as providing protection to the mucosal lining, and prevention of non-symbiotic or pathogenic organisms from colonizing the intestines. The National Cancer Institute (NCI) encourages Americans to eat 5-9 servings of fruits and vegetables per day. A survey conducted by the National Health and Nutrition Examination committee examined the amount and variety of fruits and vegetables consumed by Americans and found that only 1 in 10 people consumed the recommended servings of fruits and vegetables per day. The average American gets approximately 1.5 servings of fruits and 1.5 servings of vegetables per day. Out of the 1.5 servings of vegetables per day, around 50% of that intake consisted of potatoes and tomatoes. There is a need for Americans to consume greater amounts and different varieties of nutritionally dense colorful vegetables. Certified Organic Green Power™ provides a convenient pleasant tasting way to get the nutritional benefits of eating organic vegetables in just one scoop a day. Fruits and vegetables contain a large array of biologically active compounds known collectively as phytochemicals. These secondary metabolites are essential for the survival and overall growth of the plant as well as providing many health benefits when consumed by individuals. The fruits and vegetables grown around the world will not only be affected by the environmental conditions in which it is grown but also by the agricultural methods that are employed such as fertilization, pesticides, maturity at harvest and storage conditions. All these various growing conditions compromises the quantity of phytochemicals and micronutrients present in the fruits and vegetables, and can lead to an increase need for proper supplementation or these valuable nutrients. Organic farming does not use any herbicides, pesticides or fungicides therefore the plant has to produce more phytochemicals to protect itself from environmental factors. Consuming organically grown fruits and vegetables will provide a more abundant amount and greater array of these beneficial phytochemicals in one’s diet. Phytochemicals have been shown to play a major role in the prevention of various diseases, and are critical for certain biochemical processes throughout the body. Springboard's Organic Green Power™ uses all organically grown fruits and vegetables that have gone through minimal processing within the hour after harvesting to ensure that the maximum levels of phytochemicals, vitamins, and minerals are present. All the care that goes into sourcing, harvesting, and processing the certified organic ingredients found in Organic Green Power™ ensures that the antioxidant enzymes, phytochemicals, and micronutrients are abundant to provide the greatest health benefits when consumed. Diets high in antioxidant compounds reduce the damage and mutations cause by oxidative stress on DNA, cells, and tissues throughout the body. A major class of phytochemicals that are largely abundant in a variety of colorful vegetables and fruits are the carotenoids. There are 600 naturally occurring carotenoids pigments synthesized by plants and algae with the best known being beta-carotene, lutein and zeaxanthin. Several of the carotenoids such as alpha and beta carotene, are pro-vitamin A compounds, meaning that they can be converted into vitamin A, retinol in the body. Vitamin A is necessary for normal growth and development, vision health and immune system functioning. All the carotenoids display important antioxidant properties throughout the body. Carotenoids being fat soluble compounds are essential in the protection against damage to cell membranes, and lipoprotein vesicles caused by lipid peroxidation from free radical molecules. Many carotenoids and their metabolites are found in eye tissues and may play a role in the prevention of age related degenerative eye disorders. Chlorophyll is the green pigment found in plants, and has almost the identical molecular structure to hemoglobin with the exception of the center atom. In chlorophyll the center atom is magnesium in contrast, iron is the center atom found in the hemoglobin molecules present in red blood cells. Chlorophyll helps support red blood cell formation and improves tissue oxygenation. It also helps to facilitate the removal and deactivation of heavy metals and carcinogenic molecules, and supports detoxification pathways in the body. Salvestrols are another class of phytonutrients that are only present in organically grown fruits and vegetables. Diseased or abnormally growing cells over express certain enzymes that healthy vibrant cells do not produce. Salvestrol molecules can target these enzymes found in diseased cells, and activate the program cell death mechanisms that are being suppressed by these enzymes. Apoptosis or programmed cell death, is a line of defense that cells use when they recognize that they are diseased, virally infected or growing abnormally in an effort to protect their neighboring cells, and surrounding tissue from being damage. Once a day, place one scoop in a shaker with 6 ounces of water, apple, or vegetable juice and shake until dissolved. Organic Green Power can also be added to smoothies. Formulated without added suger, starch, color, flavor, or preservatives. Store tightly capped in a cool, dry area. Brandt K, Molgaard JP. Organic agriculture:does it enhance or reduce the nutritional value of plant foods? J Science and Food Agriculture. July 2001; 81(9), 924-931. Bennett R, Wallsgrove R. Secondary metabolites in plant defense mechanisms. New Phytol 1994; 127(4), 617-633. Hung H, Joshipura K, Jiang R, Hu F, Hunter D, Smith-Warner S, Colditz G, Rosnew B, Spiegelman D, Willett W. Fruit and Vegetable Intake and Risk of Major Chronic Disease. JNCI J Natl Cancer Inst 2004; 96(21), 1577-1584. Wang X, Ouyang Y, Liu J, Zhu M, Zhao G, Bao W, Hu F. Friut and vegetable consumption and mortality from all causes, cardiovascular disease, and cancer: systematic review and dose-response meta analysis of prospective cohort studies. BMJ 2014; 349,4490. Korkina L.G. Phenylpropanoids as Naturally Occurring Antioxidants:From Plant Defense to Human Health. Review. Cellular and Molecular Biology 2007; 53, 15-25.